3 Scientists Win Chemistry Nobel For Complex Computer Modeling : The Two-Way Martin Karplus, Michael Levitt and Arieh Warshel pioneered powerful technology that is now used to develop drugs and perform other vital tasks in the laboratory. 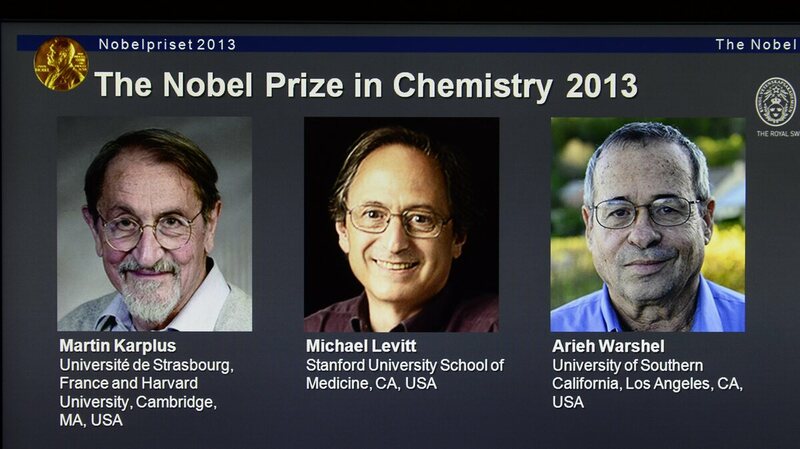 A screenshot of the Nobel Prizes webpage showing the 2013 chemistry laureates Martin Karplus, Michael Levitt and Arieh Warshel. Martin Karplus, Michael Levitt and Arieh Warshel have won the Nobel Prize in chemistry for their development of powerful computer models used to simulate how chemical reactions work, the Royal Swedish Academy of Sciences announced Wednesday. The technology they pioneered is now used to develop drugs and to perform other vital tasks in the laboratory. "Chemists used to create models of molecules using plastic balls and sticks. Today, the modelling is carried out in computers," the academy said. "In the 1970s, Martin Karplus, Michael Levitt and Arieh Warshel laid the foundation for the powerful programs that are used to understand and predict chemical processes. Computer models mirroring real life have become crucial for most advances made in chemistry today." All three scientists are naturalized U.S. citizens but also hold citizenship in another country. Karplus, of the Universite de Strasbourg in France and Harvard University, was born in Vienna, Austria; Levitt, of Stanford University, also holds British citizenship and was born in Pretoria, South Africa. Warshel, of the University of Southern California, is Israeli. On Morning Edition, NPR's Richard Harris says "Karplus ... and his group [at Harvard] were working with the spooky world of quantum mechanics to simulate simple chemical reactions." He was "using this incredibly basic physics to simulate something as complicated as a molecule ... [but] couldn't do it that well." At the same time, Warshel and Levitt were working on computer simulations of chemistry using classical physics. "That allowed them to solve bigger problems, but in a much more simplified way. So at Harvard, Warshel and Karplus combined these two approaches ... and later, working with Levitt, they pioneered the world of doing chemistry inside a computer," Harris explains. The academy said that "the work of Karplus, Levitt and Warshel is ground-breaking in that they managed to make Newton's classical physics work side-by-side with the fundamentally different quantum physics." "Previously, chemists had to choose to use either/or," it said. For more on the winners and their research, head on over to the Shots blog.